For their population-based case control study, the researchers used registry records to identify 2,961 individuals with diagnosed ASD, including 445 diagnosed with ASD and intellectual disability. The ASD patient cohort was matched with another 35,370 healthy controls. The participants were all born between 1998 and 2010 in an agricultural region of California, and 80% were male. Data from the California state-mandated Pesticide Use Registry were then integrated into a geographic information system tool that links exposure records to addresses from birth records, to evaluate prenatal and infant exposures to 11 of the 25 most commonly and heavily used pesticides. These 11 pesticides—glyphosate, chlorpyrifos, diazinon, acephate, malathion, permethrin, bifenthrin, methyl bromide, imidacloprid, avermectin, and myclobutanil—were selected for inclusion as prior studies had indicated that they may have toxic effects on brain development. 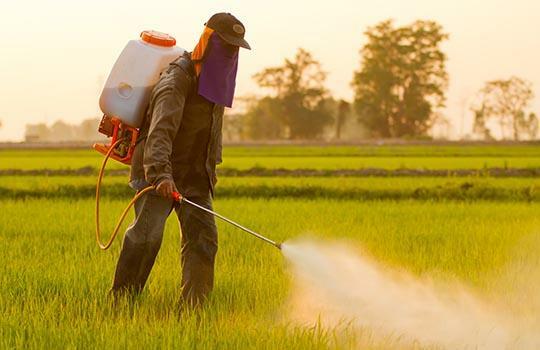 The degree of pesticide exposure was measured as pounds of pesticides applied per acre, per month, within 2 km of the mother’s residence during pregnancy. After adjustment for potential confounding factors, including markers of air pollution, the results indicated that most of the pesticides were linked with at least a small risk of ASD. “For all cases of autism spectrum disorder combined, coadjusted for developmental period-specific exposures (three months before pregnancy, during pregnancy, and during the first year of life), odds ratios were increased for pregnancy exposure to most substances,” they reported. Associations were strongest for chlorpyrifos, diazinon, and avermectin.” Exposure during the three months before pregnancy, which indicated exposure just before or around conception, was more weakly associated with autism spectrum disorder than exposure during pregnancy or the first year of life. Looking at pregnancy and infant exposure to pesticides separately, and for all cases of ASD, exposure to glyphosate, chlorpyrifos, diazinon, malathion, avermectin, or permethrin, was linked with about a 10% increase in odds ratio. Interestingly, pesticide-related risks were calculated to be strongest for individuals with ASD and intellectual disability. “Among cases of autism spectrum disorder with intellectual disability, odds ratios had greater increases (by 30–40%) in pregnancy and infancy for glyphosate, chlorpyrifos, diazinon, permethrin, methyl bromide, and myclobutanil when considering the pregnancy and infant periods separately,” the researchers reported. “Our findings suggest that risk of autism spectrum disorder increases with prenatal and infant exposure to several common ambient pesticides that have been shown to affect neurodevelopment in experimental studies,” they concluded.